(New Britain, Conn., Mar. 24, 2018) – Individual tickets for all 2018 Bees regular season home games are on sale now. CLICK HERE to purchase single game tickets. The Bees will once again offer one of the most affordable entertainment options in the area. Individual ticket prices for the 2018 season are $11 for Field Box Seats, $10 for Box Seats, and $8 for Bleacher Seats. This season the Bees will play 72 regular season home games. For the majority of the season, Monday through Saturday contests will start at 6:35 p.m. Sunday tilts in May, June, and September will be played at 1:35 p.m., while Sunday games in July and August will begin at 5:05 p.m. The Bees will also host a special Battle of the Sexes event on Sunday, July 15 that will have the Bees square off against the Stratford Brakettes in a fast-pitch softball game. This contest will begin at 7:00 p.m., while the regularly scheduled Bees game against the Southern Maryland Blue Crabs will take place earlier that day at 1:35 p.m. The full promotional schedule has been announced, which is highlighted by 13 fireworks shows, exclusive giveaways, and a special promotion for each day of the week. CLICK HERE to view the full 2018 promotional schedule. Opening day is Friday, May 4 against the Road Warriors at 6:35 p.m. 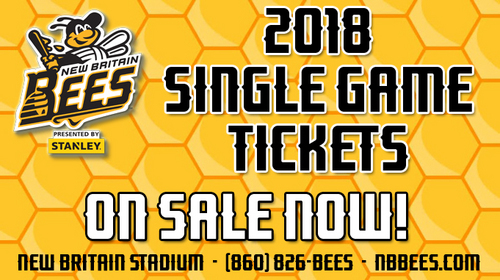 In addition, season tickets, group outings and mini-plans are available by calling (860) 826-BEES or online at www.nbbees.com.